Title: "The Australian Festival of Progressive Music"
Images courtesy of the Fleurieu Peninsula Family History Group Inc. The town of Myponga is situated on South Australia's Fleurieu Peninsula, about 60 kilometres south of Adelaide. 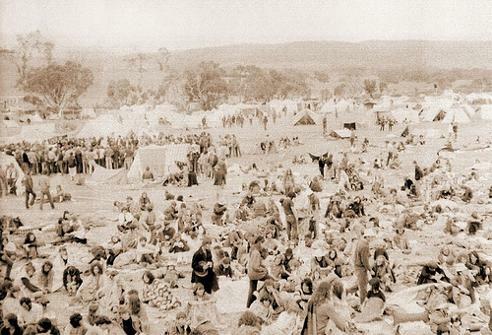 Prior to the staging of the Myponga Festival in 1971, the town's main claim to fame was the 1953 discovery of a uranium ore deposit at Wild Dog Hill, just outside the township and between 1953 and 1955, small quantities of uranium ore were obtained from the site. The Myponga area was chiefly known for dairy farming. The Myponga Festival -- its proper title was "The Australian Festival of Progressive Music" -- was held on the traditional festival date, the Australia Day long weekend, from 30 January to 1 February. It was staged just a week after the Wallacia Festival in NSW and many of the acts who played at Myponga had come direct from performing at Wallacia. The main figure in the festival organising company, Music Power, was Hamish Henry, an young Adelaide millionaire entrepreneur who had a continuing involvement with rock music in the early '70s. As well as organising the Myponga festival, Henry managed one of the headlining local bands, War Machine. Ca. 1970-73 he also managed two other Adelaide groups, Headband and Fraternity. "Music Power presents at Myponga, South Australia on January 30th, 31st, February 1st, the first Australian Festival of Progressive Music. The promoters believe that in keeping with world trends of freedom of expression and thought in all fields of art, literature and music, Myponga 71 will be an exciting, aesthetic and elevating experience through progressive music." Although there is little information available today, the Myponga festival was important for several reasons. Myponga was the venue for the first Australian performance by leading British heavy rock group Black Sabbath and it is believed to have hosted the Australian first performances by visiting Hungarian jazz-rock group Syrius, which featured the late Jackie Orszaczky. It was also the first Australian visit by leading UK heavy rock group Black Sabbath. Then at the peak of their form, the band turned in a fine performance and it is reputed to have been by far the best of their several Australian appearances. The other major overseas act scheduled was Cat Stevens, but his appearance was reportedly cancelled just before the festival began. Stevens eventually toured here in for Paul Dainty in August-September 1972. Myponga was also an important event in the careers of two leading Australian groups -- Daddy Cool and Spectrum. Spectrum's successful appearance was some months before their national hit breakout with "I'll Be Gone", and according to Adrian Rawlins, they played a very impressive set, an opinion confirmed by Carl Belle (see Recollections). The same was true for Daddy Cool, which at the time was still part of Wilson and Hannaford's larger Sons of the Vegetal Mother project. DC had been warmyl received at Wallacia and when their Myponga set totally eclipsed the Vegetals it was clear that Daddy Cool were far more popular than their parent band, so Sons of the Vegetal Mother was soon shelved for good. Filmmaker Chris Lofven was on hand with a movie camera to capture some of the DC set and this footage (often mistakenly thought to be from Sunbury) eventually found its way into Chris' landmark film-clip for Daddy Cool's debut smash-hit single Eagle Rock. Adrian Rawlins noted that the festival was well-supported by the Adelaide media, so we hope that as time goes by more material about this important event will come to light. However, some recent information sent to us suggests that violence and excessive alcohol consumption were major problems during the festival, and that there were several serious incidents, including a number of rapes. A lively exchange about Myponga took place on the Milesago guestbook in May 2003 between Carl Belle and Terry Murphy, both of whom attended the festival. We've included their comments in the 'Feedback' section below. Although Terry evidently had a good time, Carl's memories are less than rosy and he speaks vividly about the violence, the generally 'heavy' atmosphere that prevailed there and about the negative effect the festival had on progressive bands in Adelaide. "Re: the discussion about the artists appearing at the South Australian Myponga Festival, recently I learnt that a friend of mine (Ray Grieve) played at the festival in one of the Adelaide bands and today he showed me his scrapbook containing a copy of a promotional flyer and a newspaper list of bands performing and the times they were on. There are a number of anomalies but here's what they say:"
"Ray does not remember either Syrius* or Cat Stevens appearing. Ray Grieve sang in a number of bands in Sydney (most notably Elliot Gordon Union which also included Gary Lothian, later of Galadriel) before moving to SA and joining Adelaide band W.G. Berg. By the time of Myponga they'd changed their name to War Machine and were in the process of disintegrating. According to Ray, they played a terrible set! Ray subsequently moved into folk music and played with The Rouseabouts in the late 1970s and early 1980s." "I was ... sole compere at Myponga. This festival was held on a far from perfect site -- a flat treeless farm not far from a lovely beach, but quite a way from Adelaide. The event was organised by gentlemen who were not without capital. They had arranged for Cat Stevens and Black Sabbath to headline. Through no fault of theirs, Cat Stevens failed to honour his agreement, but Black Sabbath arrived, and delivered a performance of insane, unbridled energy, such as they never did again -- neither in 1973, '74 or '80. But while Black Sabbath was the Big Name at Myponga, Daddy Cool were the Big Hit. Ross Wilson's on stage persona, the band's zaniness and raunch, their pure golden rock, their elan and panache, captivated everyone and established them as the nation's number one band. Spectrum's seriousness and creativity were more completely appreciated in Adelaide than they had been in Melbourne -- though before long the band notched up a sizeable following throughout the country." "The Adelaide media supported the concept of Myponga far more vigorously than the Sydney press or TV had supported either Ourimbah or Wallacia. But the numbers of participants who actually arrived were still not over 15,000 -- not enough to put the backers into a profit situation. Had another 5,000 people turned up the festival would have been an all-round success." "I can well remember [Black Sabbath's] first-ever Australian performance at Adelaide's historic and legendary, Myponga Festival. If you have never heard of the Myponga Festival it is probably because it has been all but forgotten by most of Australia's east coast rock historians who seem to think that Oz rock exists only in Sydney and Melbourne in their time only. But Myponga Festival was one of the great Australian rock Festivals and close to the hearts of all that attended - including the aforementioned Ozzy Osbourne and many of Australia's mainstream acts. But it did not include most of today's rock historians who either snubbed the event or maybe were not even born." "Late News: A number of people at Myponga were given urgent medical treatment for drug freak-outs by medical staff at the official hospital centre. Festival organisers claimed they knew of no drug trouble. Hospital staff refused to give any details. The freak-outs, some known to be serious, confirmed earlier rumours that drugs were being circulated." "I would like to comment on the Myponga rock festival, held on Australia Day long weekend, January 1971. My recollections are very different from those of your record. The festival was marred by drunkenness, acts of violence, and several reported rapes. It was also boycotted by most of SA's leading bands, due to discrepancy in performance payments." "Best performances were by Syrius, Spectrum (after the release of "I'll be Gone"), Lipp Arthur, CoCaine (before the arrival of the insufferable Gulliver Smith), Jeff Crozier, and the Sons of the Vegetal Mother. Black Sabbath created a lot of hysteria, but their performance, I thought, was extremely disappointing (other than that of their lead guitarist). However, the continual threats of violence drove a lot of people (especially young women) off site." "Daddy Cool were an act that prevented a very ugly atmosphere from developing into a serious situation; their humour, good nature and "feel good" rock and roll completely transformed the crowd dynamics - albeit temporarily." "Adrian Rawlins as compere was rather flat; he spent much of the time performing rather silly laughs. The Myponga rock festival marked the decline of alternative music in Adelaide. The groups which boycotted the festival - including highly creative acts such as Red Angel Panic and Hard Time Killing Floor - found many venues henceforth closed to them, and a more commercial teenybopper sound was deliberately fostered in many venues throughout the city." "By the way Myponga is about 60 kms south of Adelaide, and was -- before economic rationalism -- a noted dairy centre. 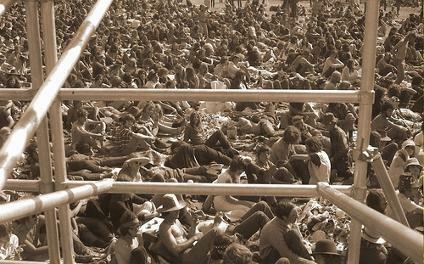 The venue for the festival was a converted dairy farm, but the facilities provided were rudimentary and didn't help foster an atmosphere of "peace, love and harmony" (the festival had been advertised as Adelaide's answer to Woodstock). For this attendee, it promoted a great interest in Spectrum and Syrius, and vain attempt to find our more about Lipp Arthur (who played a very professional set)." "Its strange how people have different views of occurrences. I too was at Myponga but I had a great time and was impressed by Black Sabbath and still have visions of watching Jeff Crozier dancing on top of a bus as Black Sabbath played and did not see or hear of any problems during the event ... I have also read of people who had a bad time at the Mulwala festival, but I had a great time there also ... but I must be one of the lucky ones I suppose. "At the risk of exceeding the hospitality of the guest book I must respond to Terry Murphy. I can remember two distinct incidents within the first three hours of the opening day which must have been witnessed by the entire Myponga audience." "Firstly, an ambulance crew were pelted with rocks and beer cans as they attempted to treat a young woman who was hyperventilating. Secondly the Wizard of Sydney was driven from the stage by a fusillade of beer cans (some full), and had his face cut (an incident which was quelled by Adrian Rawlins' brave intervention.) This set the scene for the weekend." The Ambulance crews treated numerous victims of violence including 5 raped girls and 1 raped man. (Indeed a young woman was attacked by drunks outside our tent, and but for our intervention would have been raped.) The Adelaide media carried reports of general violence, as did, I think, the Adelaide Uni paper, On Dit. The Ambulance and CFS authorities told me that crowd behaviour was easily the worst they had ever seen. Things were considered so bad that a group of Flinders Uni students tried to organize a properly run festival in 1972 at Meadows; unfortunately they did not have the money to realize their dreams. (The festival went ahead but was commercially run.)" "As I stated, Myponga more or less destroyed alternative rock music in Adelaide. As for Black Sabbath, as I mentioned there was a lot of hysteria, and their mere appearance was enough to provoke a positive reaction. (I always thought Jeff Crozier's dancing was a satirical statement; certainly the musicians I sat with couldn't believe the muffed entries and the discrepancies between bass/drums and lead). Certainly most of the Australian musicians put on a much better showing than the over-rated Sabbath." "Well I did seem to hit a nerve with Mr Carl Belle. It was not my intention to slight your version of the events but just to give my view as I saw it ..I never witnessed or heard of any of the things you mentioned that is not to say they may not have occurred but we all know media reports can distort happenings O.K." "I went to these events for the music and nothing more and was elated at what I saw and experienced If your experience was soured I am sorry the people who marred these events are normally only a few percent of the total attendee's but its because of them that future events have trouble getting up and going ... "
"I will agree with Terry Murphy that it is the disruptive minorities that have spoiled rock festivals. In 1969-1970 Adelaide had developed a really creative and progressive rock scene, probably equal to any in Australia, and fairly closely linked to elements of the counterculture. Musical influences extended from rock as theatre through progressive rock to jazz/rock fusion and blues. Throughout 1969-70 there had been a number of open air and other concerts at various SA locations, all of which had passed without major incident." "The Myponga festival changed that. The dubious reputation of some of the financial backers and the boycott by Adelaide's leading groups kept many fans away. The debate among musos, critics and others which followed agreed on one thing; that although some great music had been played at Myponga, the festival itself had overall been a failure and largely ruined by violence, drunkenness, poor security, and lousy management. Many of the groups who had refused to participate, were "punished" by influential figures among Adelaide's venue owners; with the result that many successful bands either folded (through lack of work), or the key musicians drifted interstate to the thriving musical scenes in Melbourne and Sydney." "It was a tragedy for a state which had produced band of the calibre of Red Angel Panic, Hard Time Killing Floor, Abraham Lots Blues Band, Lotus, which while probably ranking a little behind the great Australian bands of the early 70's -- Spectrum, Syrius, Tully and McKenzie Theory -- were original and full of musical ideas." "I'm glad Terry, you had a great time. I didn't; I'll never forget for example the two thoroughly traumatized 16 year old girls my girlfriend (now wife) and I drove home, or the later wilful destruction of many of Adelaide's most promising and interesting bands. That era remains probably the most productive in alternative Australian music." Special thanks for their contributions to Carl Belle, Vince Lovegrove, John Low, Sam Pickering and Terry Stacey. Please email webmaster@milesago.com if you have more information or correctionsm, or to report any broken links.